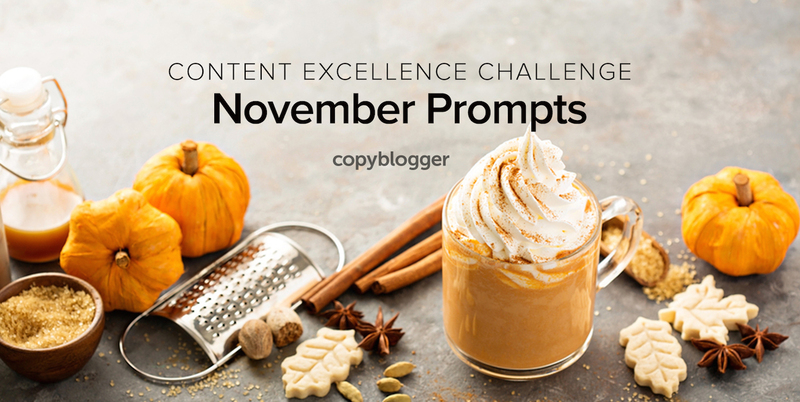 It’s time again for our pair of Content Excellence prompts! All year, our community has been working with these each month to create better work, and to create more of it. This month’s prompts could potentially be swapped, because they’re both ways to do better work and more work. They go together like (dare I say it?) pumpkin and spice. So … let’s make it happen. But just in case your own journal isn’t overflowing today, I spotted this suggestion from our friend Tara Gentile of CreativeLive and the CoCommercial community. “… list out 10–20 ideas or topics you vehemently disagree with in your market. Then, list out 5–10 aspects or features of your product or service that you’re incredibly passionate about. Finally, list out 5–10 misconceptions your potential customers make and how your offer turns them around. Once you have your list started, you’ll find ideas popping into your head to keep it populated. And each idea could well be the start of a series or a collection of related pieces of content. I just returned from a great conference, where I saw dozens of good friends. There was hugging, there were late-night conversations, there might have been some beer. And it reminded me all over again what a potent source of energy it is to connect with people who care about you. If you’re not building what you want to build, find someone to talk to. Now, sometimes social media is an okay place to find this person. I’ve had some great late-night heart-to-hearts on Facebook chat. And Tara’s CoCommercial community is a wonderful place to find support. But whenever you can manage it, it’s so much more profound to connect in person — or at least over the phone. What’s going to be on your enthusiastic topic idea list? Want to share a few of those items with us? How about your connection list? Is there someone who’s always had your back, professionally or personally? What will you do to respark that connection? Thanks so much for these two prompts. Perfect way to get into a groove for the coming year. I completely agree. Reconnecting with someone in person is so much better than over social media!